JFrog Artifactory is well acquainted with Visual Studio Team Services (Azure DevOps) and Team Foundation Server (TFS) and has provided integration to these Microsoft DevOps tools for quite some time. And as these technologies have moved forward, so has JFrog. We’re THRILLED to announce the all new JFrog Artifactory Extension providing integration with Azure DevOps and TFS. Make no mistake. This is not an upgrade of the old plugin (which is now deprecated); it’s a newly designed, newly developed extension that brings advanced repository management for Microsoft-based CI/CD pipelines – whether on-prem (with TFS) or in the cloud (with Azure DevOps). Here are some of the things you get with it. 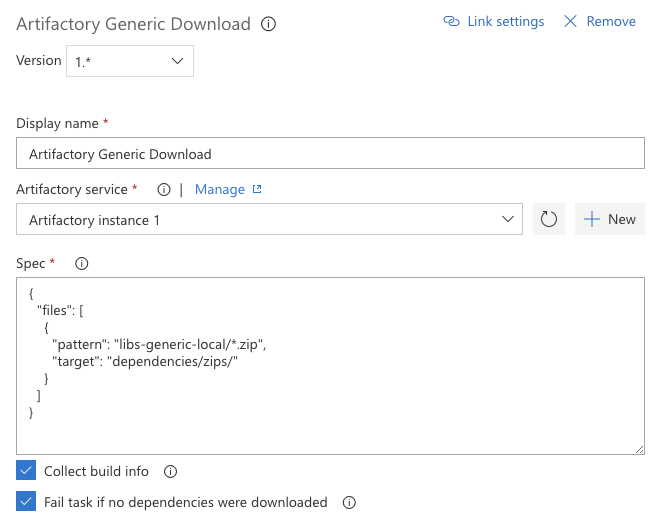 Complementary to downloading dependencies, you can upload generic Azure DevOps/TFS builds to Artifactory, again using convenient file-spec notation to specify build artifacts and the Artifactory target repository. But that’s only what happens on the surface. Have you ever needed to reproduce a bug on a very specific build? When downloading dependencies and uploading build artifacts, the JFrog Artifactory extension collects exhaustive build information such as package versions, dependencies, system properties, environment variables, user information and more, and stores it locally during these two stages of your build. You can then publish this information along with your build when you upload it to Artifactory. All this information is like having a bill-of-materials at your fingertips making it easy to reproduce a build at any time. And there is a convenient link from the Azure DevOps console to the corresponding build information in Artifactory. To support your artifact lifecycle, the JFrog Artifactory Extension lets you promote your Azure DevOps/TFS builds in the cloud from one repository to another. Using this capability within a Azure DevOps/TFS pipeline gives you control over your artifact lifecycle, letting you promote builds as they pass through quality gates to corresponding repositories for QA, staging and finally, deployment to cloud production systems facilitating a fully automated release pipeline. Wait…What Platform Are You Running On? Well, it doesn’t really matter, since the JFrog Artifactory Extension supports Linux, MacOS and Windows build agents, so whatever platform you’re running on, you’re covered. This is only the beginning. The new JFrog Artifactory Extension already helps you achieve faster generic builds, both in the cloud and on-prem with Azure DevOps and TFS, but this was just the first release. In the forthcoming weeks, we will be adding more capabilities including support for Maven, NPM, NuGet, Conan and Docker builds, Azure DevOps/TFSA release management and more. Keep your eyes peeled, keep your builds running. The Azure DevOps JFrog Artifactory Extension is now available on the Azure DevOps Marketplace.